Easy Pasta Recipes for every occasion. Fresh, quick and easy pasta is a classic dinner option you’ll return to time and again. 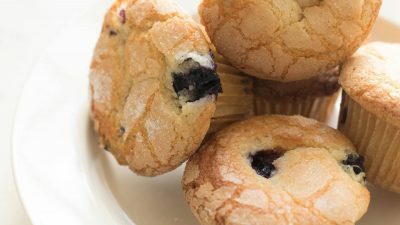 Many of these classic recipes are made with just a few ingredients from your pantry! These easy pasta recipes are so incredibly good. 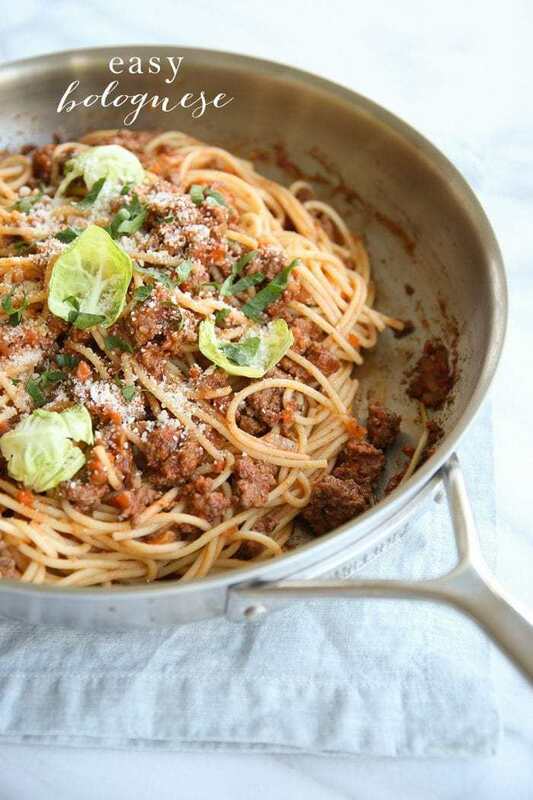 Make dinner stress free with classic pasta dishes the whole family will enjoy! 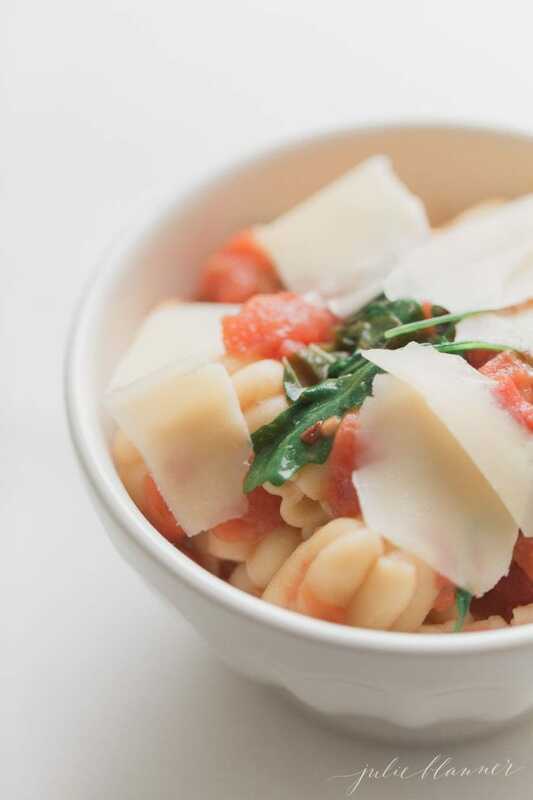 No matter what you have in your pantry, there’s a pasta recipe for you here! From one pot pastas to slow cooker options you’ll find easy pasta recipes for every occasion. It’s no secret that pasta is my absolute favorite! Through the years I have shared a lot of homemade pasta recipes. Many of them require just a few staple ingredients. Start with a boiling pot of water and end with a delicious meal you’ll savor. Let’s start with the classics along with recipes that require just a few ingredients! Limiting the number of ingredients also limits prep time! If you find yourself in a pinch, chances are you’ll have the ingredients to make at least one of these dishes. Most of the ingredients in these recipes are pantry staples. These go-to recipes are perfect during a winter storm or when you’re avoiding a trip to the grocery store. This oil and garlic pasta is a light and flavorful three ingredient traditional Italian dish! It’s made with pantry ingredients in just ten minutes. On the table in just ten minutes, this is the comforting adult version of buttered noodles. 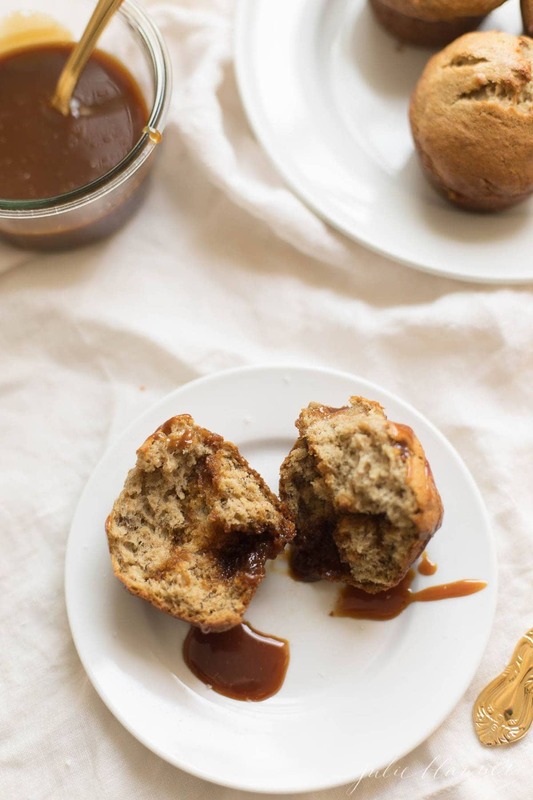 You won’t believe the texture and flavor from these simple pantry ingredients! 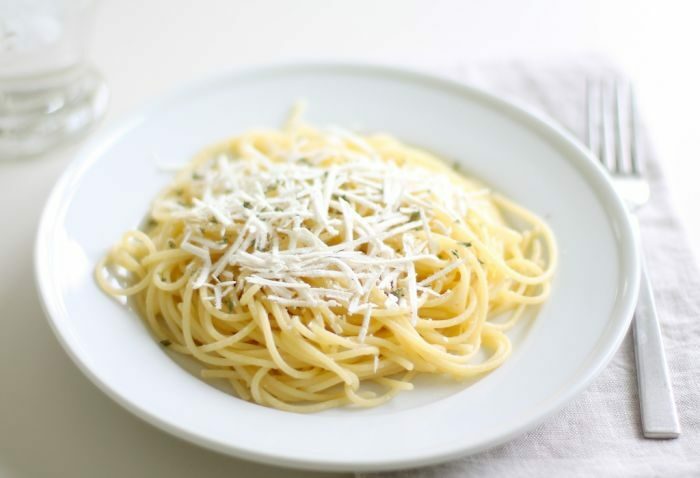 A dash of pepper flakes gives it just the right kick, with fresh grated parmesan cheese on top. 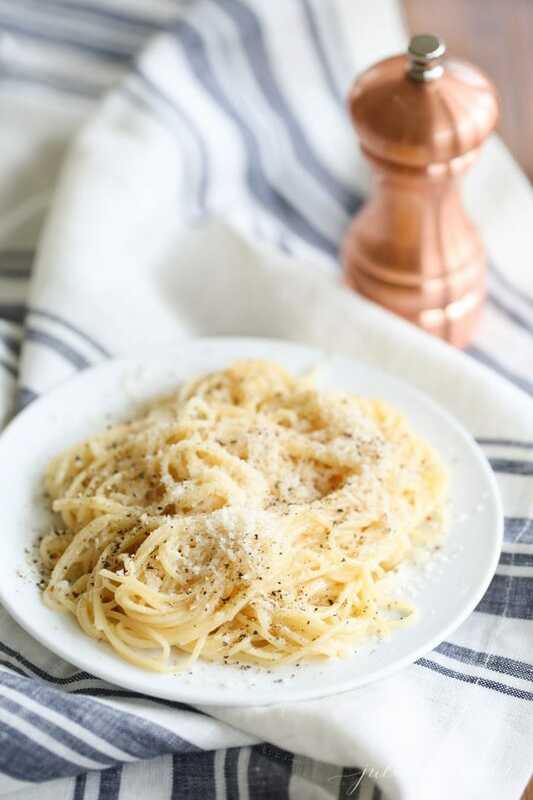 A simple Roman dish made with cheese and pepper which is always a favorite of adults and children alike! This dish is similar to an alfredo, but a touch more refined. Good cheese (finely grated) and big bites of fresh cracked pepper make a world of difference! Give this one a try to replace the mac and cheese your kids love one night… you’ll be glad you did! A classic one pot recipe that is rich, creamy and full of flavor. This one is not light on calories but it’s certainly full of flavor! Buttery, garlicky and refined enough to serve guests but easy enough for a weeknight dinner. There’s a reason this classic pasta dish is always a favorite on Italian restaurant menus. 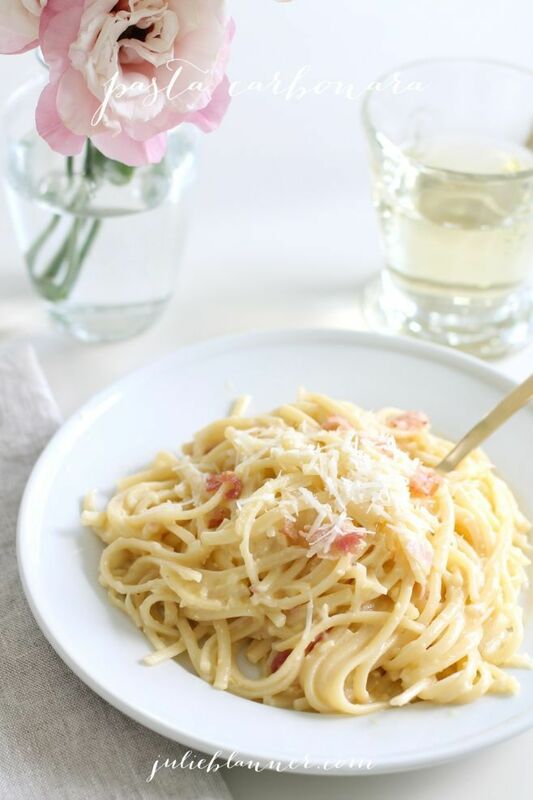 It’s one you’ll return to again and again… it’s similar to a fettucine alfredo sauce! A simple, flavorful dish that is a little lighter than many of my pasta dishes. 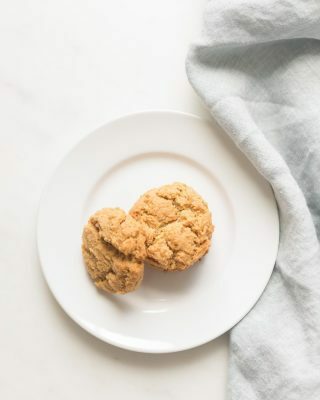 Coming in at just 310 calories per serving, it’s not going to stall your diet and you’ll get the comfort you’re craving! Mizithra cheese has a flavor that cannot be matched, and the browned butter adds a deep nutty richness to this dish. How can you go wrong with a classic pasta dish? These are the rich, warm, meaty recipes that we crave on cold winter nights. When you don’t have a cute Italian grandmother to make these for you, I’ve got you covered with simple, hearty pasta recipes you’ll crave. 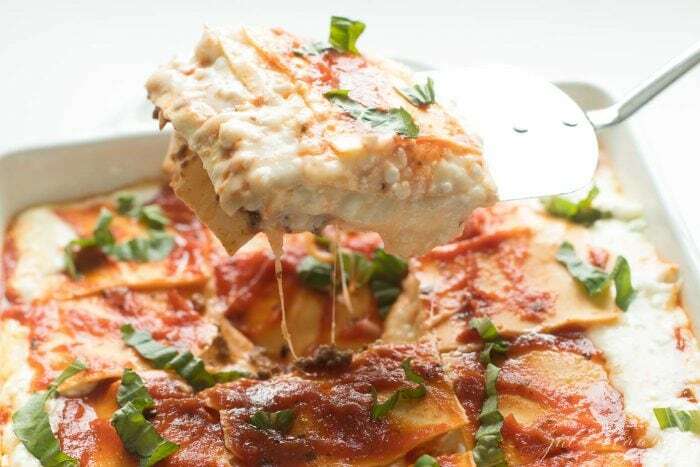 An easy lasagna recipe made in just 10 minutes hands-on time for an effortless weeknight dinner! This lasagna with cottage cheese is so incredibly gooey and filling. It’s a rich, classic entree that can be made ahead. A few shortcuts and tricks make this a weeknight dinner that your family won’t be able to resist! Paired with a salad, what could be better? 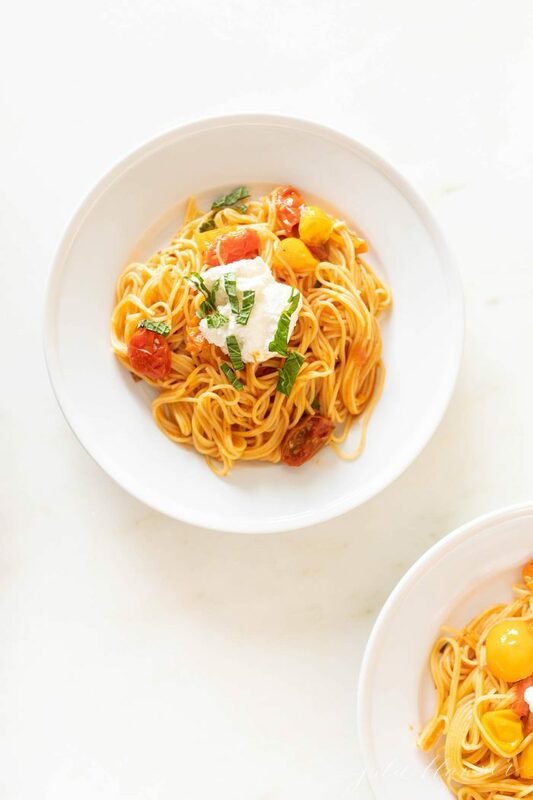 A light and refreshing Cherry Tomato Pasta Sauce that comes together in minutes. This Tomato Pasta has it all – a little heat sprinkled in with bursts of sweet cherry tomatoes. 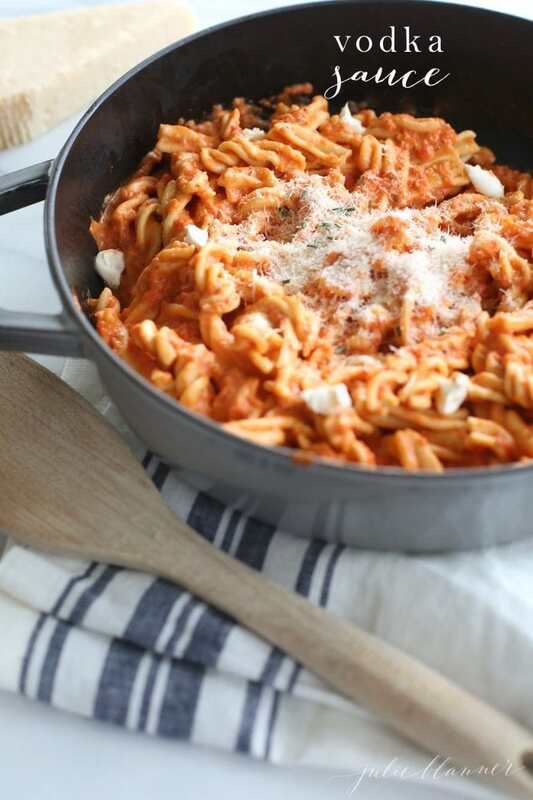 A classic vodka sauce with a touch of mascarpone for a delightfully creamy texture. This pasta sauce has a little kick, and the spicy finish pairs beautiful with your Friday night glass of wine! Creamy, textural and so flavorful… this one will be your go-to weekend date night dish. A classic bolognese with carrots and onion infused with rosemary for a memorable dish. If you have picky eaters, this sauce is a great way to sneak in some veggies because it’s full of them but they are hidden well. It’s fragrant, herbal and rich with flavor. This sauce comes together quickly and it doesn’t need to simmer all day- so delicious with just a couple shortcuts! 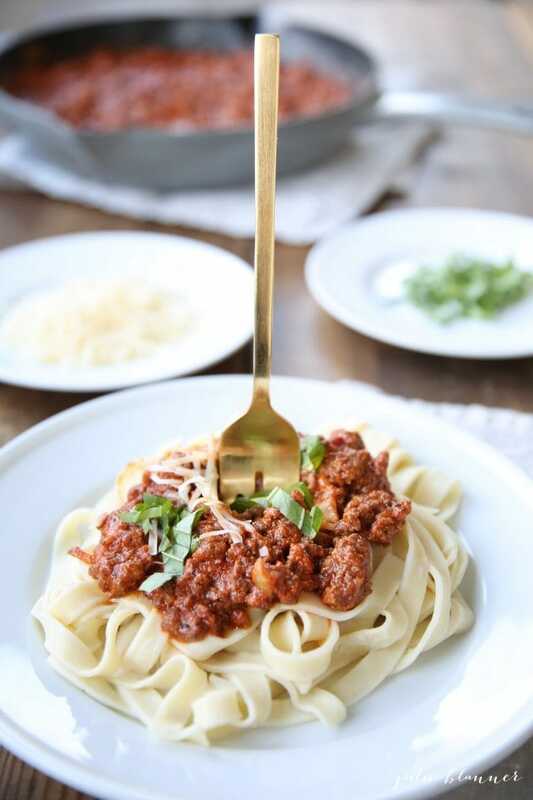 Homemade bolognese sauce that’s filling and while it’s simple to make, it tastes like you were working all day. 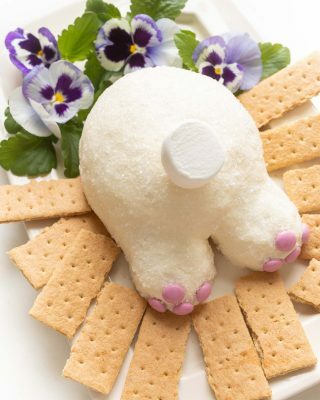 Easy to make and feed a crowd becuase it’s something almost everyone enjoys! Rich with the scent of bacon, this is a classic you’ll return to frequently. An easy one pot pasta dish that’s full of flavor and will warm you up, perfect for a winter Sunday meal. This dish simmers in the oven for hours and while it’s simple to put together, the flavor is out of this world! 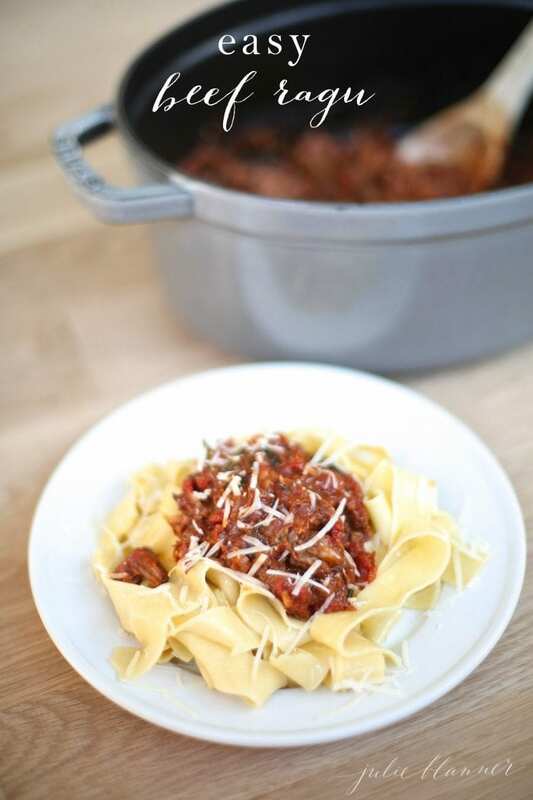 We enjoy this pasta sauce with pappardelle pasta. 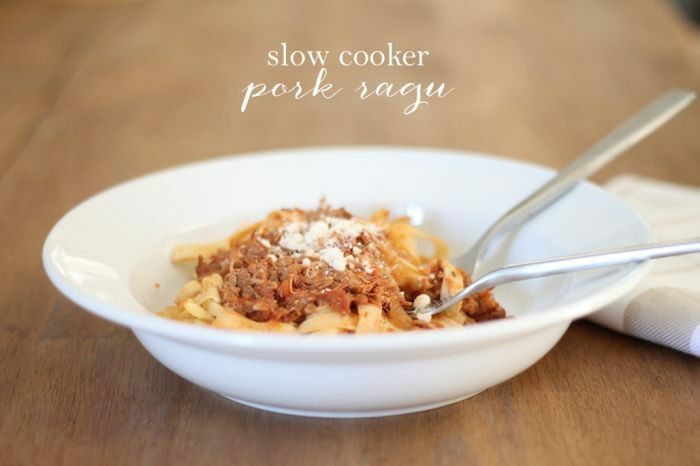 An easy pasta recipe made in a cast iron pot or a slow cooker. Allow it to cook all day as it fills your home with an amazing aroma as it becomes incredibly tender. Cooked with apples, honey and lots of vegetables, this dish is perfect for fall or any time of year. These dishes will give you the comfort and warmth of your favorite pasta recipes, with a little lighter sauce to bring the calories down. As much as I would love to eat pasta every day, my hips don’t lie! It’s nice to have a lightened-up option that will still give me the comfort I crave! Easy, light and flavorful pomodoro sauce recipe to spice up your dinners. Filled with good quality tomatoes, arugula and basil, you won’t miss the added fat or calories here! This is a lightened-up pasta dish to love. 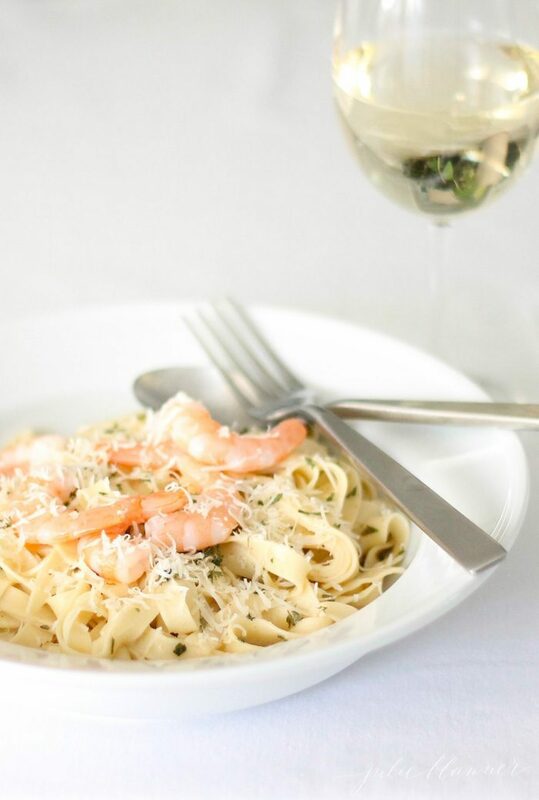 This easy white wine sauce is perfect for pasta, seafood and chicken dishes. It’s light and refreshing for spring, summer and fall! This sauce is light, refreshing and crisp… perfect with a glass of Sauvignon Blanc you’re using to make this dish. One of the most popular recipes I’ve ever created, this one is a must-try! 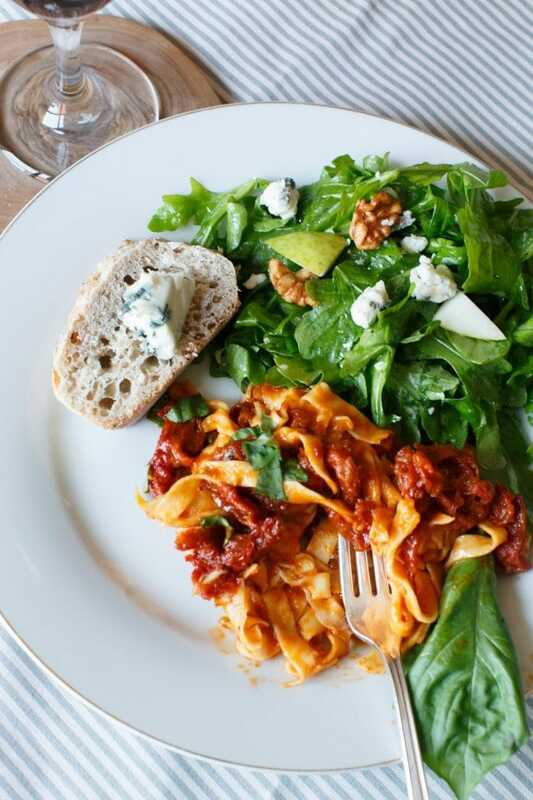 A quick and easy pasta that is light in calories, this sundried tomato sauce focuses on the rich flavor of the quality tomatoes you purchase. With that flavor infused throughout the dish, you won’t miss any heavy cream, cheese or butter additions here. Yum! One of our favorite easy pasta recipes for spring and summer. 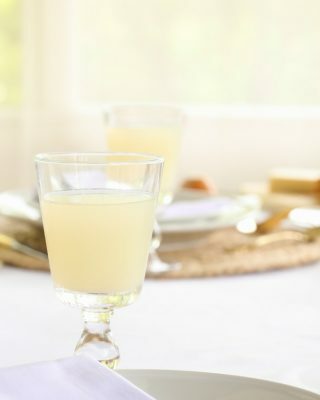 It’s light and refreshing and tastes amazing warm or cold! If you’re hoping to lighten up any pasta recipes, increase the flavor with fresh herbs and citrus notes. You won’t regret it! These dishes might be a little more adventurous, but I urge you to give them a chance! You’ll find that the flavors created with these additions will make a pasta night you’ll be savoring for a long time to come. A fresh and flavorful spring and summer-infused pasta that’s full of flavor. 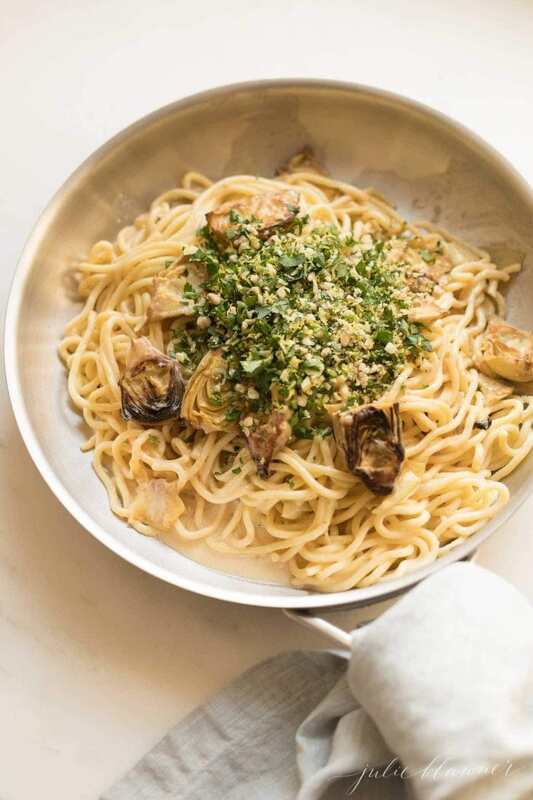 This dish features a light lemon sauce tossed with pasta and topped with gremolata. Pan-fried artichokes are rich and flavorful, adding the perfect texture to this dish. Perfect for a meatless night! 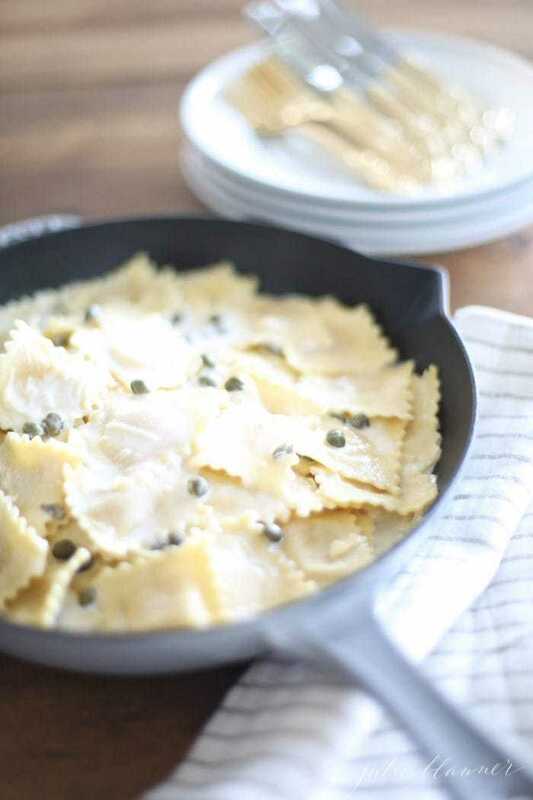 A 10-minute fresh and flavorful pasta dish, capers are everything in this dish. The briney flavor is not to be missed, and this sauce is perfect with homemade or store-bought ravioli. Bring a large pot of water to a boil and make it salty like the sea. Prepare pasta al dente (slightly undercooked) for heartier sauces. Making noodles ahead? 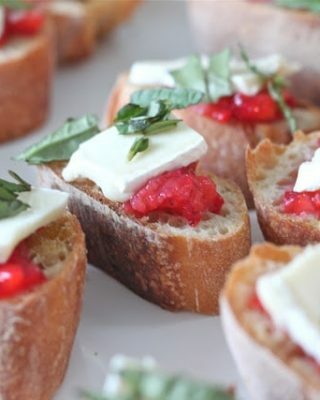 Toss with olive oil to keep them from sticking. 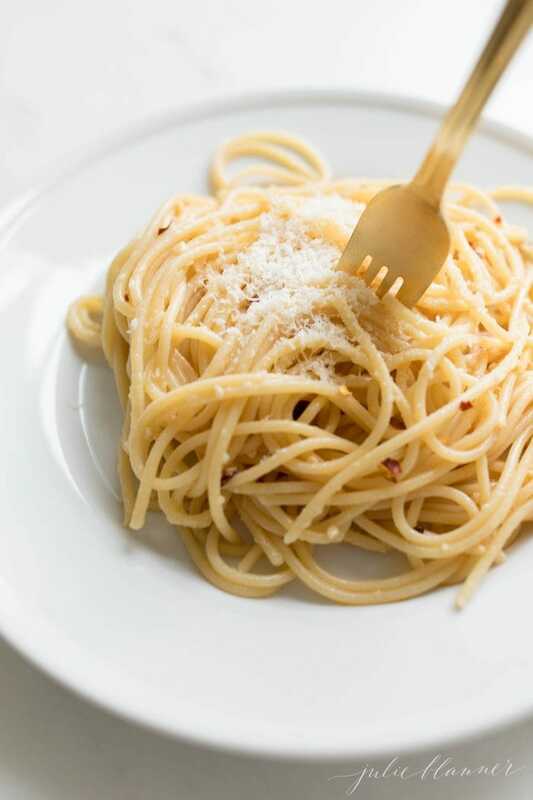 Use pasta water to thin any sauce. 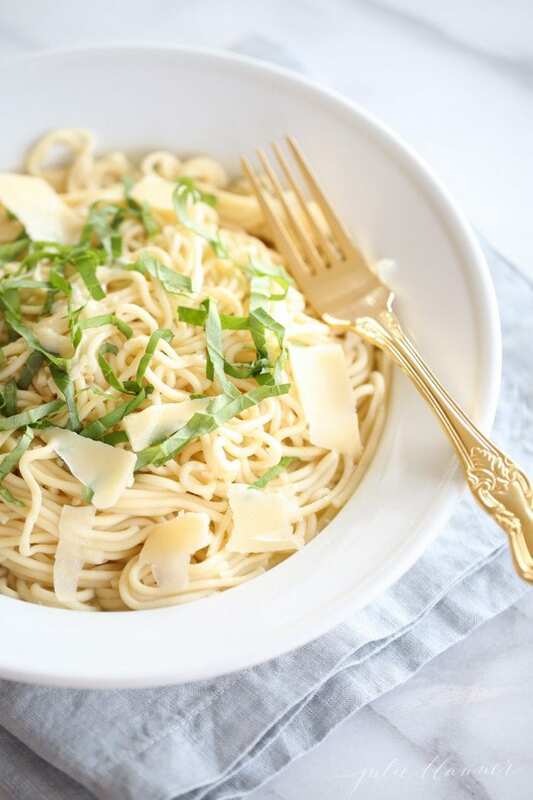 Garnish with parmesan cheese and fresh parsley. 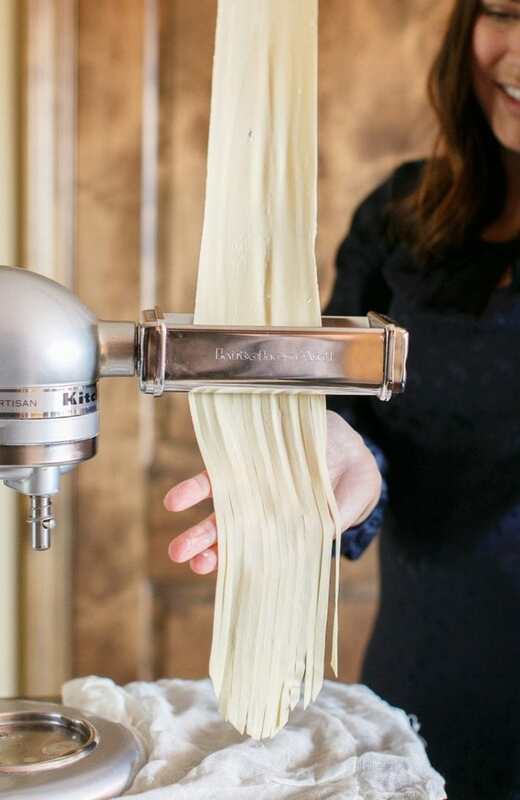 Get all my best tips for making homemade pasta in just minutes. You won’t believe how simple it is- you’ll be done in the same amount of time it would take you to cook a box of grocery store pasta. Our family loves these easy pasta recipes – I hope they become a part of your family’s traditions, too! 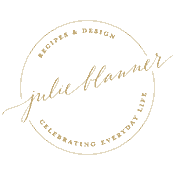 Please share here or on Pinterest if you try any of these easy recipes.